. . . no small feet: to wig or not to wig? 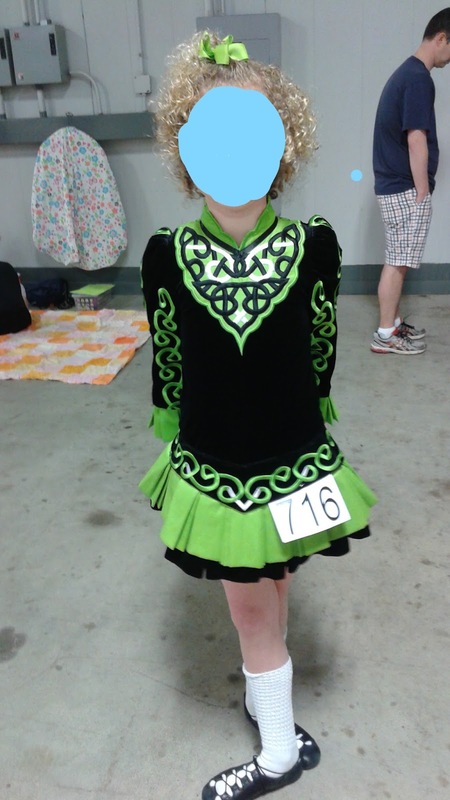 I woke up at 2:30 in the morning the day Curly was scheduled to Irish dance at National Championships in New Orleans a few weeks ago. I think part of my problem was that I hadn't eaten my 'regular' stuff. I'm like an old lady when it comes to my food intake. I require oatmeal, a salad, a grapefruit, an apple, meat and potatoes, and umpteen glasses of water each day. Traveling has a nasty habit of interfering with my meal plan. This boring regiment began when I was diagnosed with Celiac disease. I have a somewhat realistic fear of surviving hunger pains with no gluten free possibilities available. I tried to catch up on my dehydration status by drinking water from the sink in the hotel room. I assume it has something to do with the climate in New Orleans, but the water from the tap was HOT. No joke. Making a run to the ice machine in my PJ's wasn't happening. There were sleeping bodies -that I hoped to keep sleeping - everywhere. Our system of checking into a hotel room secretly breaking fire code hasn't changed since I wrote about it in: 'Can I be a real kid?'. Eventually I did snooze for another 30 minutes just before my alarm was set to go off at 5:30 am. That helped to take the edge off, but I knew the day would be a bit fuzzy for me. Curly had to be downstairs in the hotel ballroom at the stage by 7 am. Mini didn't have to be there, but she wanted to help tape Curly's shoes, get her warmed up, and be there for moral support. Taped shoes. This was not even a thing when my kids started dancing. Who knows what trend they will think of next! 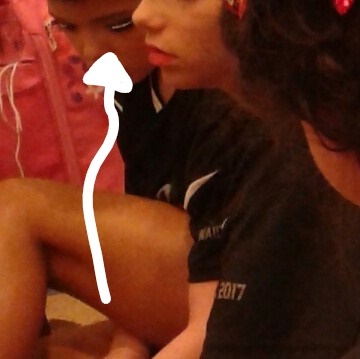 This dancer put sparkles on her eyelids. Yikes! Her wig also looked like a Marge Simpson impersonation. It was SO high! I got the two of them up once I was ready to go. We crowded in the bathroom trying not to disturb the sleeping family members strewn across the floor. Mini showered, both girls ate breakfast, and I attached Curly's wig. Yes, you read that correctly. Curly, who looks like she is wearing an Irish dancing wig on any given day thanks to her beautiful head of naturally curly hair, was donning a wig for the competition. Curly and I agree, her curls are better than fake curls. Still hard to predict what those damn judges prefer. 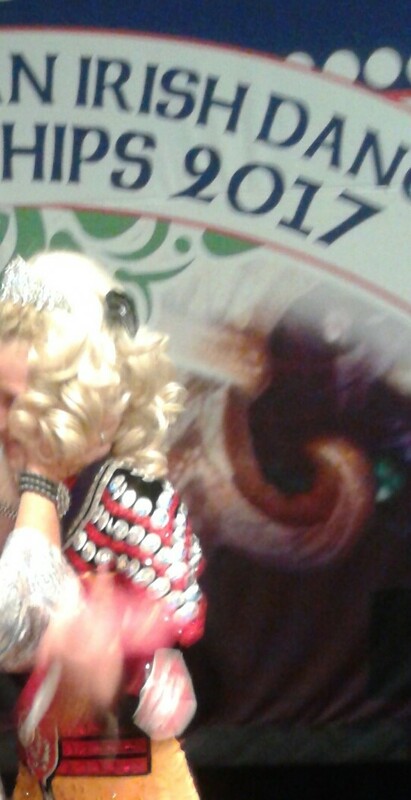 Not a great picture, but this is a profile of Curly in a wig and a sparkle dress since she's under 10 now. Her teacher is holding her face in her hands to congratulate her. The wigs that these dancers wear are just SO ridiculous looking. The fake curls are clearly part of a costume. They can't compare with natural hair. We feared that Curly would be overlooked by the judges because she looked so different (better- but still different) in her everyday curls. Like I've said in an earlier post, I avoid blogging much about Irish dancing because it's a lot to explain to everyday people (translation: mainstream folks who have avoided enrolling their kids in Irish dancing classes), who appreciate everyday curls. Curly wearing a no-sparkle dress and her own hair! Last year Curly wore a dress void of any sparkles to Nationals. 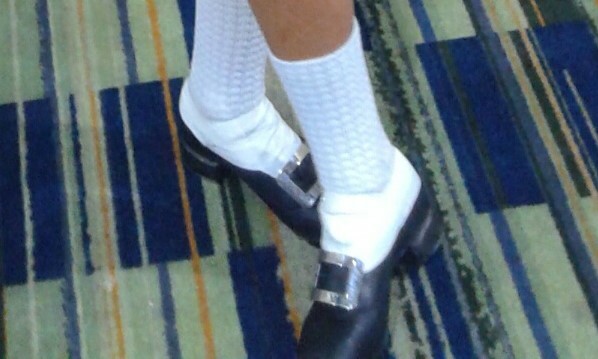 In our Midwest region, sparkles are banned until a dancer reaches the under 10 age group. I'm fine with this restriction, because the dancing dresses can become so over-the-top. This rule does make it complicated to sell a dress with no sparkles, because it limits who can wear it. Since it is not a national rule, the other dancers in Curly's category at last year's Nationals were able to wear sparkles. I didn't bother to add bling to Curly's bling-less costume. I didn't borrow a dress with bling. I thought she looked great, and I rolled with it. I must admit that I realized during the competition last year that my eye was naturally drawn to the flashy dresses. I suppose it is just human nature. I had to wonder if the judges focused less on Curly because she wasn't 'shiny'. As much as it goes against my personal beliefs, I convinced Curly that she ought to wear the wig this year to Nationals to be sure she wasn't being overlooked. Guess how much fun it was to separate her tight curls in order to create several little pony tails under the wig? The wig gets attached with bobby pins to the little ponies that jut out all over the girl's head. Poor Curly. Poor Mommy. 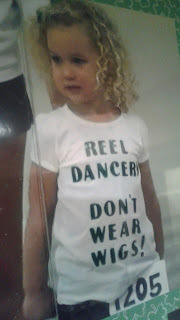 To think, I'm the mom that created this t-shirt for my curly-haired toddler back when her older siblings danced, and she didn't. Well, not officially. Curly showed up at every competition sporting this my-mom-hates-wigs original t-shirt. She hopped around to the music near the stage while her siblings competed. Ah, the good 'ole days. So reader, do you think I am crazy for covering my kid's gorgeous hair with a wig? Her natural hair is SO BEAUTIFUL. But I totally get why you would need to do something different for the competition. It kind of reminds me of the use of flippers in beauty pageants. Even if you (or the judges) KNOW that the kids don't have perfect, straight, white-as-snow teeth, it can be distracting to NOT see that! would the redo be awarded? THIS IS NOT A DORM!